All rare earth metals in one professional Set, each Element sealed in an ampoule under argon! The ampoules have a diameter of 11-12mm and are about 45-48mm long. 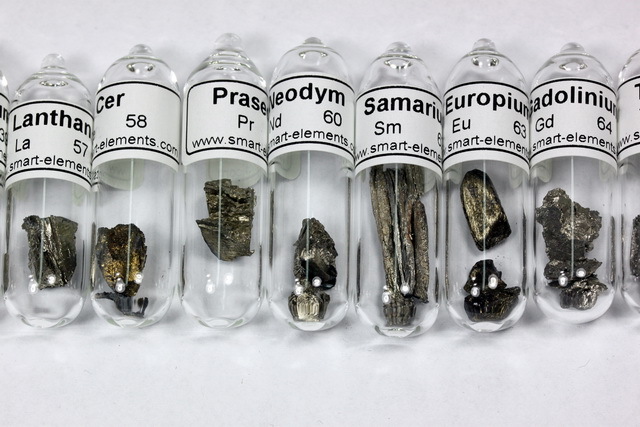 Metals like Europium, Cerium and Lanthanum are filled under special and extremely dry conditions in a glove box to keep the metal as shiny as possible. We do not fill any crumbs, filings or other low value material but ONLY carefully hand-selected pieces! glass-ampoules are carefully cleaned and dried by a special process for several hours to remove even the slightest traces of humidity to make the samples last a life-long. We use shatter-proof tempered glass, which are able to survive a 1 meter drop on a tiled floor. Some elements like Europium, Lanthanum and Cerium are handled and filled under very dry and oxygen free atmosphere in a glove-box to keep the surface as shiny as possible. lifelong warranty on breakage - should an ampoule break accidentally we replace it for free!